Join hundreds of local cyclists after the Miami Critical Mass ride at Omni Park (located less than 1 mile from Government Center). Enjoy food trucks (Chilean Street Food, Vibe 305, + more), drinks, music, skate ramps, and more. Admission is FREE. Come inside the park or ride back to Government Center, do not linger on the road outside the park. The Magic City Bicycle Collective will be in their new space (a modified shipping container) set up at Omni Park with all their bike repair tools, they will demonstrate simple bike care and do minor bike repairs and maintenance. Come to them if you need air in your tires or help with your bicycle. They'll also have t-shirts, tubes, and bike lights for sale. Please make a donation if you use their services, they are an all volunteer based non-profit! 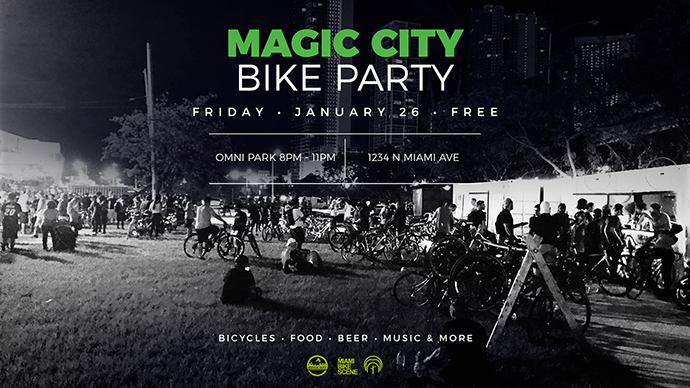 The Magic City Bike Party is a collaborative effort between Magic City Bicycle Collective, The Miami Bike Scene, Omni Community Redevelopment Agency, Urban Implementation, and Poplife.